Magnolia stellata may be small but it produces a mass of stunning, bright white, star-shaped flowers opening from silky buds quite early in spring, around March-April. The gently scented, unusually-shaped flowers are up to 10cm across and contain up to 18 petals. Following this spectacular display, the slender foliage emerges bright green and glossy, occasionally gaining attractive bronze tints in the summer. An award-winning compact Magnolia bush, Magnolia stellata is ideal for small gardens and looks equally beautiful when kept in a pot. 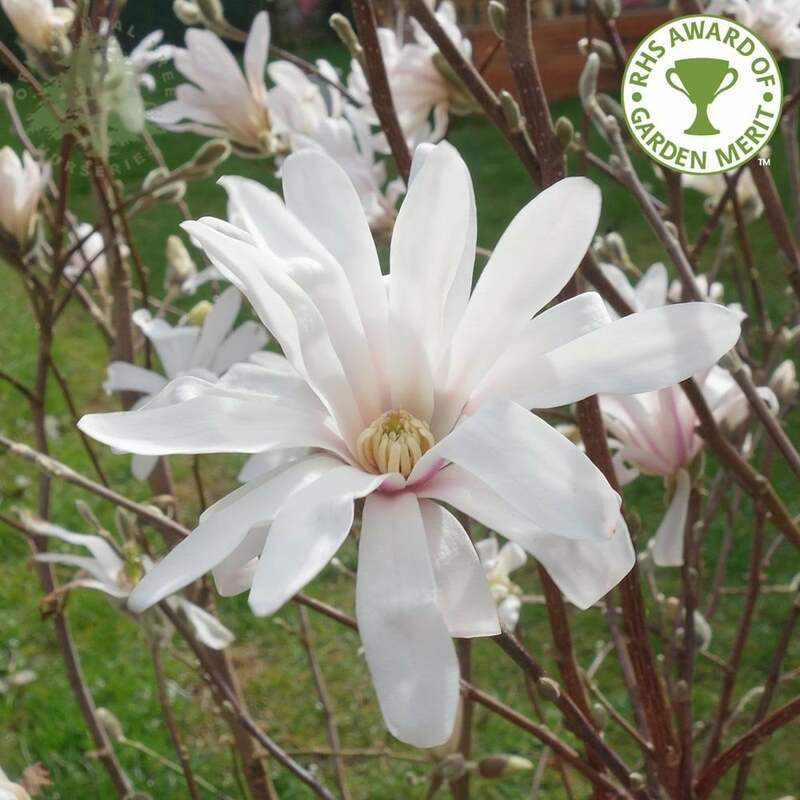 Growing to just 2 x 2 metres in 20 years, this striking white Starry Magnolia is best suited to a sheltered position in any well-drained soil in either sun or light shade. Our pot grown Starry Magnolia can be planted at any time of the year. Firstly, remove all weeds and grass within a metre of your desired planting hole. Dig a square hole as deep as your root mass and approximately 2x as wide. To help your Magnolia establish more effectively, sprinkle root grow in the hole. Gently remove the pot but do not try to loosen the roots of Magnolia trees before planting. They have a fleshy root system and can be quite fragile. Using 50% of the original soil and 50% compost, fill in the hole and firm around gently. Make sure not to bank the soil up around the collar of the tree. For tree forms of Magnolia stellata, we recommend using a stake and tie kit and rabbit guard when planting, but these are not needed for the bush forms. The help and advice section has further information and videos. If you’re planting Magnolia in spring or summer, water well for the first few months. Increase watering if there are extended periods of hot or dry weather. Magnolias do not cope well with dry soils so this is especially important. If planting in autumn, you may only need to water a little. Irrigation kits make it easier. Once planted, keep the area free of competing weeds and grass for the first couple of growing seasons. If your area is prone to rabbits, use a rabbit guard. Starry Magnolia trees can be pruned into shape, but should not be heavily pruned as they can go into shock. Simply remove any damaged branches or any that are growing in an awkward position. If pruning to limit the overall size, stagger your pruning over a few years to alleviate the stress on your tree. Pruning for Magnolia stellata should be carried out in mid-summer to early autumn. Avoid pruning in late winter to early spring.